I knew not to expect the big broad Will Ferrell comedy going in, but I'm not sure everyone will. The trailer for "Everything Must Go" certainly plays up the comedic parts of the movie; no doubt to appeal to the legions of Ferrell fans, but it was clear this small, reality-based film was not really about Ferrell being funny. 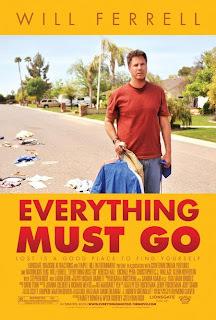 No, "Everything Must Go" instead expands on how good of an actor Ferrell truly is. He is a gifted funnyman, notably one of our generations best and history will write him that way but he has also shown us he can do much more. 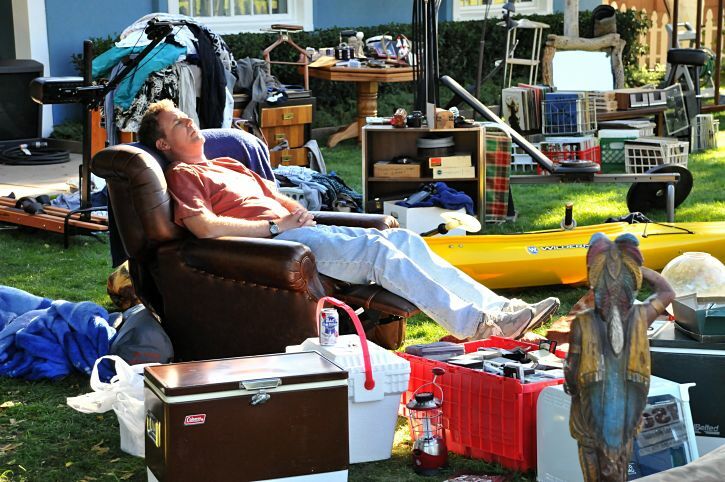 In "Stranger than Fiction" he played a down on his luck everyman destined to die at the hands of an author writing his life story and now in Dan Rush's directorial debut "Everything Must Go" Ferrell is down on his luck again but in a much less fantastical way. as he reclines in the front yard. Ferrell plays Nick Halsey, a vice president at a major corporation who, on the same day, his wife decides to leave him as well as being fired from that high-level job. 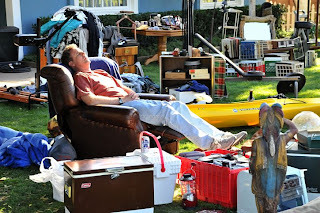 In the event of his wife leaving she has also changed all the locks on the doors (even the code on the garage) and placed all of Nick's worldly possessions on the front lawn. Seeing as Nick is way too depressed and well on his way to being drunk by six o'clock, there isn't much he thinks to do besides relax in his recliner and enjoy the sunset. It is an engaging premise, a fun one with a quirky quality to it but like all films of this genre it touches on a very specific point, a naturalistic aspect of human society that makes not only the main character realize something about themselves but also speaks to the viewer and comments on the existence we are living in as well. And no, maybe the serious side of "Everything Must Go" won't speak to everyone but the metaphor of putting on a cover for everyone else while trying to conceal all your problems and issues behind closed doors is one we have all been through at one time or another and the idea of letting it all hang out has no doubt also crossed our minds to the point where being able to watch Mr. Halsey physically demonstrate it is a kind of relief. up a business deal in "Everything Must Go". Ferrell portrays Halsey as a man who neither asks for our sympathy or tries to make light of his situation. He only says what is required, but he is firm in no longer giving into peoples requests. He has been jaded by a life that he worked so hard to create and was taken away in the blink of an eye. It is clear that Nick doesn't really much care anymore if he is breaking the law by living on his lawn, he doesn't care that the more he drinks the further he relapses, he is living by his own standards and why shouldn't he? He has clearly driven everyone away to a point they don't want to be around him anymore (or to even care to help him) so why should he try to recover once again? In his experience recovery has most likely only been a brief moment that preludes another fall, another misstep in his episodic life. Sitting on his lawn, organizing it into a makeshift living room though opens Nick's eyes to the truth, the reality that he isn't the only one with serious issues and in a way this makes him feel better about himself. He befriends a neighborhood child played by Biggie Smalls real life son Christopher Jordan Wallace and develops a genuine friendship through coaching him on baseball skills and teaching him the methods and tactics of a good salesman. Wallace is a wonder in the role, bringing just the right amount of innocence and light to make Nick's growth and personal development completely real. A new neighbor across the street portrayed by the wonderful Rebecca Hall also adds some weight to the decisions and ultimately changes Nick decides to make. Hall brings a warmth to her role that allows Nick to trust her and thus gives him a clarity about life that seemed to be missing before. Nick catches up with and old high school friend (Laura Dern). "Everything Must Go" is rounded out by what are really cameos from both Michael Pena and Laura Dern as a local detective and Nick's sponsor at AA meetings and an old high school friend that lends some much needed advice and company to Nick in a time of serious confusion in the midst of everything that is falling down around him. Director Rush fleshed out even these smaller roles to bring a sense of not only credibility to his main characters situation but to allow the progression of that main character to be completely understood and almost inhabited by the viewer who goes on this journey with Nick. I have probably made this film out to sound much deeper than it actually is, but it carries every theme I have touched on and it really did translate to me with much more sincerity than comically. Sure, it is a light comedy that drags at certain times and probably has a few too many endings, but it is no less a fine film with a fine lead performance from Ferrell that has set the stage for his ever expanding career.